How to Convert OST to MS Outlook? If you want best answer of this question, you can go ahead with this software, which is famous and fabulous i.e. OST emails conversion tool. This OST converter software is an intended project with highly advance techniques so that users can simply convert OST to MS Outlook PST file. 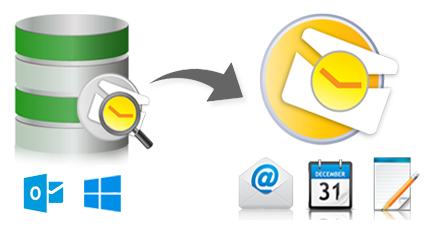 This conversion can be attained converting all your mailbox data from Microsoft Exchange Offline Storage Files including; Email attachments, Calendars, Journal, Draft, Contacts, Tasks, Notes, Appointments, Deleted ITEMS etc. OST files belonging to Microsoft Exchange 5.0, 5.5, 2000, 2003, 2007, 2010, and 2013 can be easily converted to PST (MS Outlook) files without any alteration in your previous OST files data. Convert OST tool is an advance and powerful OST emails conversion application to convert Offline Storage Files (.OST) to Personal Storage Files (.PST) when Exchange Server goes down due to any reason and you cannot access your crucial OST mailbox database. In such situation where OST files are inaccessible, you can use our Change OST to PST tool, which provides you best & trustworthy results as compared to other OST conversion utility, which is available in online market today. Through OST file conversion software, user can rapidly convert OST files to PST format of MS Outlook and view all OST emails in MS Outlook application. With the assistance of this tool, users can also repair corrupted OST files and save to PST file format at once, without having any special technical knowledge. Try OST Emails conversion tool, which is a great way to get back your crucial OST file data information. If you are pleased after using demo version software, then you can go for Professional OST recovery software full version to attain OST recovery and resolve OST to PST conversion problems. Your OST mailbox data can be recovered well! Get full version license of OST emails conversion program to transfer/move/convert unlimited OST files to PST files. After complete conversion process, you can save converted data in your machine. Unexpected application & Server shutdowns. Virus attacks on the system harming data. Software out of order or hardware malfunction. Erroneous deletion of user email account from Exchange. Re-synchronization of .OST files with MS Exchange Server. No storage space & capacity to create backup for heavy OST files. Upgrade from old server into new Exchange Server. Easy to use and flexible Installation & Uninstallation. OST converter software GUI (Graphic User Interface) is very user-friendly. Software is capable to convert password protected OST file data into PST file. Tool can restore original format of RTF & HTML emails into PST file. Recovers Emails, Calendar Entries, Tasks, Contacts, Notes, etc. from OST files. Software supports MS Outlook 2003/2007/2010/2013/2016/2019. Software supports MS Exchange 5.0/5.5/2000/2003/2007/2010/2013 & 2016. Tool securely converts corrupt OST data into healthy PST file. "Massive OST Email Recovery Software, I got all my emails back with this OST to PST Converter Tool." "I got astounding results using OST to PST Email Conversion Tool that helps to convert OST to PST in a few seconds."